Two of the participants in April's free Basic Skills Clinic, held the first Saturday of the month in Malibu Creek State Park. The next Skills Clinic will be held on May 4th. Shameless Plug Alert. 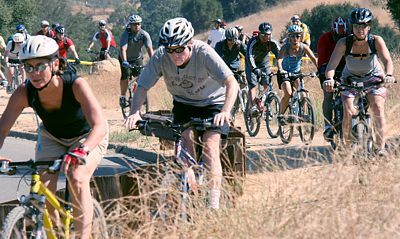 As the coordinator and instructor for the monthly CORBA Introduction to Mountain Biking Skills Class at Malibu Creek State Park, I look forward to the first Saturday each month to help yet another group of eager mountain bikers become safer and more proficient. I also provide private lessons (mountainbikeskills.com) and have gotten quite a few new clients over the last couple of months, which is pretty typical for this time of year, what with the weather getting nice and a crop of races just around the corner. What continues to amaze me is how many people think they don’t need coaching. As I say all the time, even the best athletes in the world have coaches. I see people in the CORBA classes who have been riding for quite some time who have developed bad habits that are quite debilitating. And they almost always can be easily corrected with a few minor adjustments. But the adjustments aren’t always intuitive or obvious, and that’s where a coach comes in. If there were a better way to improve one’s technique instead of using interpersonal coaching, I think they would have come up with it by now! So hopefully I’ll see you one of these months at the FREE CORBA skills class. No reservations needed. Come back as many times as you like, it’s always free! September's Beginners' Ride had 16 participants. Would you or a new rider you know like to join us too? 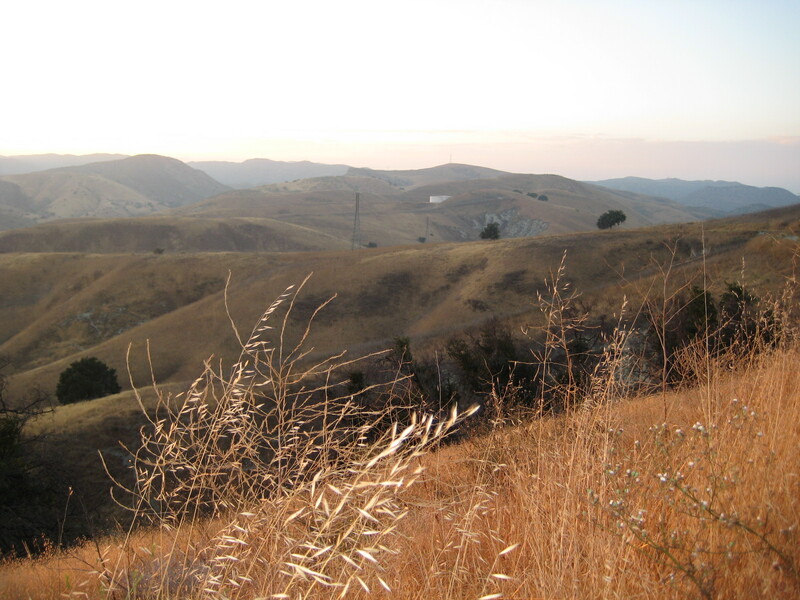 2013 Santa Monica Mtns Trail Days at Sycamore Canyon Report from April 20-21. During the annual Santa Monica Mountains Trail Days in Pt Mugu State Park, CORBA volunteers with the help of a few others repaired drains and cleared brush along the entire 1.8 miles of the Wood Canyon Vista Trail, a segment of the Backbone Trail. The SMM Trail Days is a weekend-long event organized by the Santa Monica Mountains Trails Council that has taken place at the end of April for 32 years running. As well as helping with trailwork on Saturday and Sunday morning, volunteers are able to camp over Friday and Saturday night at the Danielson Multiuse Area, enjoy a barbecue dinner on Saturday, and win great prizes on both Saturday and Sunday in appreciation for their work. On Saturday morning, 17 CORBA Volunteers and a few others were shuttled from the registration area to the bottom of the Wood Canyon Vista Trail. See our blog article for more of the events of the weekend, the completion of this trail on Saturday and Sunday, and photo galleries. May 11: Guadalasca Trail, Point Mugu State Park. 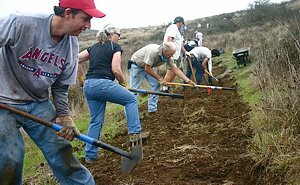 If you missed your chance to help fix up the trails in PMSP during the Santa Monica Mountains Trail Days in late April, you can come out and help us work on Guadalasca Trail this month. This long singletrack is a mtn biking favorite! For details and to register so we'll know how many to prepare for, see our online registration page on Meetup.com. June 8: Backbone Trail - Mesa Peak Trail, Malibu Creek State Park. Details will be forthcoming. The Cheeseboro Reservoir, capable of holding four million gallons of water, can be seen in the distance. Along with a pump station at Palo Comado Canyon, the reservoir will be demolished and removed during April and May. THOUSAND OAKS, Calif. – The National Park Service (NPS) is advising visitors that trails at Cheeseboro and Palo Comado Canyons will be intermittently closed during April and May due to the demolition and removal of surplus water conveyance infrastructure. Several days of trail closures are expected, though limited to weekdays between 8:00 a.m. and 5:00 p.m. Visitors can find up-to-date information on trailhead signs, by calling 818-889-8996 or by visiting www.nps.gov/samo. Triunfo Sanitation District (TSD) will be removing the Palo Comado Pump Station and the Cheeseboro Reservoir. These facilities, owned by TSD, were built in 1959 at the behest of comedian Bob Hope, who had hoped to build thousands of homes in the surrounding area as part of a master-planned community. TSD is decommissioning the facilities as part of an agreement with the NPS and other agencies. Large trucks will be hauling salvaged materials along both the Palo Comado and Cheeseboro Canyon trails to recycling centers. For their safety, visitors are asked to refrain from using these trails when posted as closed. Entrance to trails from Cheeseboro Canyon, Doubletree and Smoketree trailheads will be periodically closed. The China Flat trailhead and trailheads for Upper Las Virgenes Canyon Open Space Preserve will remain open. The NPS and TSD appreciate the public’s cooperation with this effort. Additional information is available by calling 818-889-8996. Bells Bells Bells Bells! In accordance with CORBA & IMBA, GGR will start to incorporate using BELLS on their bikes. Bells and communication on the trails with the hikers and equestrians is key to keeping all users of the trails aware that bikers are coming. GGR is now soliciting sponsors for their main event Oct 20th at Malibu Creek State Park. This is also a CORBA membership drive and fund raiser. Please email wendy@girlzgoneriding.com for details on becoming a sponsor. It’s EASY! Saturday May 4 is the next skills clinic.